A vaccine is a biological medical product designed to stimulate antibodies inside the human body against any antibody attack. Vaccine helps in providing immunity against various infectious diseases. Vaccines can be broadly classified as prophylactic and therapeutic. Therapeutic vaccines also known as treatment vaccines spur the immune system to attack targeted tissue and is a biological combination designed to develop immunity against a diseased cell or tissues. Therapeutic vaccines are developed to treat ailments from various cancers, HIV and Alzheimer’s disease. Therapeutic vaccine is used for curing and prevention of cancer whereas prophylactic vaccines are only used for prevention of cancer. Globally increasing instance of HIV and cancer is expected to drive the demand for the therapeutic vaccine during the period of study. Geographically, North America dominates the therapeutic vaccine market driven by large pharmaceutical industry base, best in class healthcare infrastructure, strict regulation and higher spending on the healthcare by citizens of the region. North America was followed by Europe and Asia-Pacific as second and third largest markets for therapeutic vaccine market. Asia Pacific is projected to have the fastest growth, owing to rapidly developing medical infrastructure, increasing medical tourism, newer expanding pharmaceutical industry, and increasing awareness and spending on healthcare by population in developing nations such as China and India in this region. This report identifies the global therapeutic vaccine market size in for the year 2014-2016, and forecast of the same for year 2021. 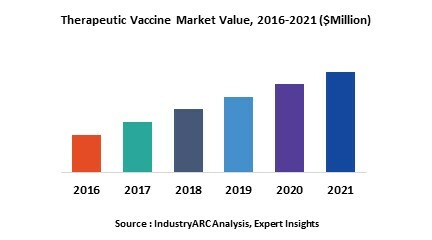 It also highlights the market drivers, restraints, growth indicators, challenges, and other key aspects with respect to the therapeutic vaccine market.